Russian media outlets are holding up the Mueller report as another example of American dysfunction, with President Trump a symptom of larger problems. Thus far, official Russian response to the Mueller findings has been scornful. Leaders are taking the conclusions of US. Attorney General Robert Barr – that the report shows no collusion between the Kremlin and US President Donald Trump – as a chance to dismiss all claims of Russian interference in the 2016 US presidential election. Those alleged “larger problems” are emphasised in what, for Russia, has been a much bigger news story in recent days. Sombre Russian journalists commemorated the 20th anniversary of NATO’s decision to bomb Yugoslavia for its suppression of the Albanian independence movement in Kosovo. Their reports cast NATO’s Operation Allied Force as a US-led attempt at “regime change.” The bombing campaign “failed to destroy most military targets, but was highly effective in terms of killing civilians,” read one report on RT’s Sunday evening news show, The Weekly. At the same time, Russian media is playing up the political divisions in the US. They suggest that the Mueller report will stoke rather than heal them. In line with many tabloid publications around the world, Russian news also immediately emphasised the calls for “retaliation” and “punishment” coming from Trump supporters. This difference between the two leaders is emphasised at every turn. Trump, despite his Mueller victory, is portrayed as weak, even as Russian pundits speculate that he may now win re-election. 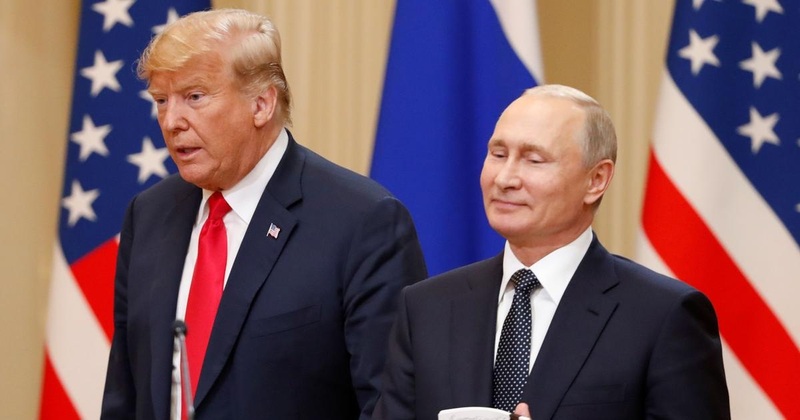 The skit showed Trump as a bumbling, blustering figure who was consistently outmaneuvered by Putin. The Russian president was portrayed as knowing more about secret US military sites around the world than Trump did. Putin – no surprise – ultimately won the contest 0-6.